In honor of the release of the highly anticipated Bullitt helmet and to celebrate 60 years in the motorcycle industry, Bell Helmets recently hosted its 60th birthday party in the heart of New York City. For the occasion, Bell transformed the Carhartt showroom into a motorcyclist's paradise full of vintage helmets, unique artifacts of motorcycling history and modern apparel. Motorcycle lovers, old and young, strolled through the rooms to admire the historical gear while meeting, conversing, and connecting with other enthusiasts. Testing the fit on a ex-Roland Sands 250cc grand prix bike. Photo by Spurgeon Dunbar. Evel Knievel's XR and Bell helmet. Photo by Spurgeon Dunbar. Tubs of Miller High Life and PBR were iced down at the entrance. I chose to keep it classy as I popped the top on a High Life while my co-worker, Ryan, opted for a cocktail from the bar. Drinks in hand, we made our way past the beer tubs and were greeted by one of Evel Knievel’s famous Harley Davidson XR750 stunt bikes, equipped with a parachute release lever located right below the clutch. Also on display was a series of Knievel’s Bell crash helmets and one of his famous jumpsuits. Knievel was wearing a Bell Star helmet on that New Year’s Eve in 1967 when he crashed his Triumph T120 while trying to jump the fountains at Caesar's Palace in Las Vegas. The Bell Star likely saved his life that night. 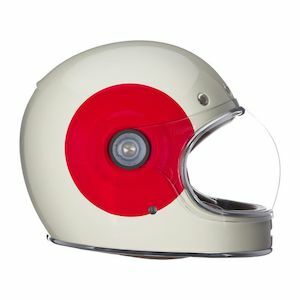 A young and unkempt band belted out a set list of original grungy, indie-rock music from one of the display rooms while members of the moto community mingled and examined the huge selection of new and vintage Bell helmets. The hallway was lined with classics like the original Star, the Moto 3, and the TX 500, all scarred from years of abuse. A few rare drag racing helmets, distinguishable by their individual eye ports, were included, as was a 10-pound monstrosity of a helmet used by a bomb-disposal unit (below right). Bell makes helmets for everything from drag racers to bomb disposal units. As we drifted into a separate showroom, a woman was explaining that the 250cc two-stroke race bike on display was on loan from Roland Sands’ personal arsenal, a keepsake from his days racing in the AMA series. Though Roland was rumored to be in attendance, neither Ryan nor I caught a glimpse of him. The woman introduced herself as Jessica Klodnicki, Bell’s executive vice president and general manager. She mentioned she was picking up a new, “Italian Red” Vespa scooter, which launched Ryan, a notoriously rabid Vespa fan, into an impassioned discussion of the inner workings of his greasy, 1978 Vespa P200. Jessica introduced us to Chris Sackett, who, along with reviving some of Bell’s most classic designs, was responsible for getting us on the guest list. He shared his perspective on the new Bell Bullitt. Based on the buzz surrounding the helmet, Chris’ enthusiasm is justified. The Bullitt offers full-face safety while maintaining the style and look of a classic Bell. The result is a helmet that appeals to the leather-clad rider rocking the 2013 Harley Sportster “48” or the guy in the Levis Trucker jacket tearing it up on a 1971 Moto Guzzi Ambassador with the rattle-can paint job. Even better, Ryan then introduced me to the young designer himself, Chad Hodge. In addition to working with Bell’s design team, Chad runs a small shop in Brooklyn where he designs and rebuilds old-school motorcycles. His current winter project is a BMW R75/5 for personal use. From a young, emerging designer, to Bell corporate executives, to a scruffy moto journalist, we all naturally cross barriers by tapping into the same enthusiasm for two wheels. We instinctively understand one another’s passion, whether it is sparked by an Italian scooter or a German café racer. We can share a laugh of recognition over the times when enthusiasm leads us to a place where we have a garage full of bikes, all which feed our souls, yet not one is fit to provide minimal comfort for a passenger. Bell’s contribution to that enthusiasm is 60 years of innovation and design. It’s committed to creating products that not only keep riders safe, but also allow us to project our own style while doing so. Bell’s continued success is due, in no small part, to its understanding of the community surrounding its brand. The party continued into the evening, long past the time listed on the invitation. With no shortage of conversation topics to be had, Ryan and I were in no hurry to head back to Philadelphia. After all, our train was not until 8 a.m. the next morning and there was still plenty of beer on ice. Luckily, we were in the city which never sleeps.